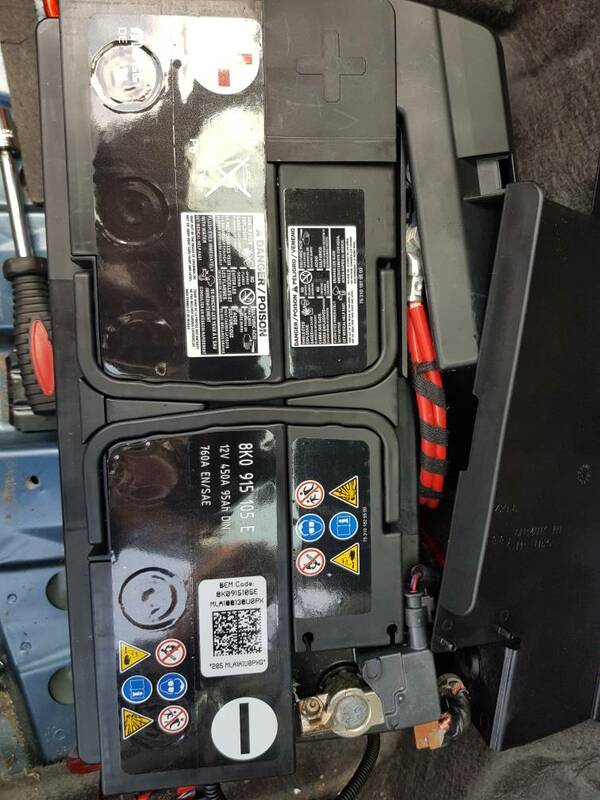 When you replaced the battery did you tell the car? Are you sure you replaced with the correct type of battery "Standard" or "AGM" as removed originally fitted? You need more info, perhaps from a better tool like VCDS. If the battery and alternator is OK then something else is setting off the energy manager, and most likely it is something drawing more current than it should. The old way would be to connect an ammeter in line with the battery and check the current - if too high then pull fuses one by one until you identify the culprit. Just how "safe" are these battery places, I stuffed my reg (S4) into Tayna(sp) and they only suggested WET batteries, I stuffed my Audi p/n of the original and correct battery into the same site and again only suggested WET batteries - my car has an AGM battery. Now, someone correct me if I'm wrong, but I thought that most B8 onwards A4s would have regenerative braking, ie smart charging and that usually means that it is AGM territory? 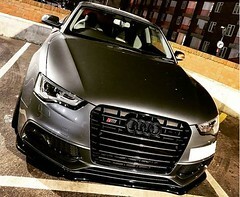 OP, what model year is your A4? Hum, so maybe having a WET battery is okay then, I hope so. Edit:- the other thing being reported on here is, if you have replaced the original battery with a suitable or maybe even slightly bigger battery, then recoding the battery management controller with the new battery code is not essential as the car would learn the new battery parameters quite quickly - as I said not my words but words of others that have replaced batteries without recoding. One thing that I notice when looking at Yuasa batteries was, they don't, or didn't at the time I checked them, give battery codings with their batteries - I find that strange as any battery suitable for that installation should come with the sticker with QR coding on it. Edit:- that is what that BEM code label is all about that is shown on what was probably your original battery. The photo of the OE Battery would show a large "AGM" lettering clearly visible (if it were AGM). As it does not, I would assume the correct type of battery has been refitted. The recoding should reset the Energy Management, but if you keep driving, it should clear in time assuming you do a reasonable mileage without everything (lights, heated screen etc.) on. AFAIK most B8 A4's and all S4's have AGM even without the Stop/Start as they are a much better, longer lasting battery. My mistake is that I haven't recoded the battery as I didn't knew it before, and I don't have cables to do that. Will try to find a garage to do that next few days. I replaced my own OE battery (AGM) as it was 8 years old, before any "Energy Management" problems started. I did not have to recode, as it was a seamless change and the car never knew! I also kept a 12v charge on the posts under the bonnet, whilst I swapped the battery in the boot. Coding is not hard with VCDS. I believe you can actually re-enter the original coding no. and it will work! [Add to Log] Saving the original value to a log is strongly recommended. Type the New Battery details into the New value field. Note, the New value must be 26 (alpha numeric) total characters including the spaces! If in doubt check the saved log for the original battery formatting details. Providing the value was accepted by the controller the new battery coding is complete. [Close Controller, Go Back - 06] "
Would it work if I buy a vag cable from ebay and download vcds? Or I need a better cable, ross tech? I think the ebay versions only read codes, you can't carry out "Adaptation" or writing to ECU. You should be able to use OBDeleven to do the codeing. It will cost about £60 or so, not sure how much VCDS is and a cable is. Lots of info on OBDeleven if you Google, or watch YouTube. I've done an adaptation with it to clear a fault after updating my car's firmware and found it pretty straight forward, I think I would struggle with VCDS. Even look on the VCDS map on this site I'm sure somebody close could sort you out. Carista will not do it. Some good info in this thread for OBDeleven. I've just bought OBDeleven and it should arrive between 8th and 18th nov as is shipped from Lithuania. For the moment "coming home" light are working properly as I deleted the fault with Carly. Didn't tried to leave radio on for longer. Will see how it goes after Obdeleven arrives. Thank you guys for all your help. Just remember to install the app now and start earning those free credits. I got my dongle direct and it took less than a week to arrive to the UK. I then paid for the pro version on the OBD offical site also as it was cheaper than purchasing it through the google play store, all you get is an email with a code to enter into the app and unlock the pro features. Just follow the same instructions you get to do a VCDS long code. Its obviously to exactly the same but easy enough to interpret. If you were to leave the original battery until it got to the state that power management was cutting stuff then just fitting a new battery and not coding it would not immediately help you. The car does take some time to register the fact it no longer has a duff battery. The action of recoding the battery information tells the car it has a new battery. If you replaced like for like with a new factory battery the only thing you would change is the serial number. So if you don't have a BEM sticker on your new battery just change the last digit of the existing code. As regards the OP's issue although the battery is good and the alternator is good have you checked the standby current when the car is locked and unused. Dash cams, extra audio etc can all increase parasitic drain resulting in reduced battery capacity and these kind of issues. This thread has given me food for thought. I wonder if it's time to replace my battery? CAN gateway energy management is always scanned on my current s5 and old a4, its because i have a dash cam which i switch on parking mode sometimes if I am at friends or car parks.. Doesn't worry me as I know what it is. As already asked by others do you have dash cam or anything? I got lucky that when i had a nearly dead battery the replacement automatically registered and I didn't have to code, but I agree is worth having the new one coded as plenty do say they had to have it. I do have a dashcam but that runs via a hidden cable to the cigarette lighter so once the car is switched off it is barely on for 5 secs before it switches to battery power & then switches off. I did notice last winter that the battery could drop as low as 20%, will have a look when I get in it tonight to see what % it is at. I've had energy management active and also quiescent currant? fault codes for about a year now. This is when scanned with carista, not sure if it's an actual fault or just low battery as the car only does short journeys. Also stop start never works unless we do a longer trip, it's never let us down though. Have put up my own thread now rather than highjack this one, but short journeys are common between you and I. No stop/start on mine but equally car always starts so if it is holding back the essential energy it needs to get going then it's doing a grand job! This is why I replaced my OE Battery even though it was OK.
8 years is plenty (I thought) from an OE Battery. it isnt a fault in my opinion, literrally the exact same codes on both my audis everytime i scan, even after a new OE battery, dash cam draws additional energy on all my cars and causes the message, but not had any issues from it. dont pannic! I've had issues though as my leaving home lights won't work, clear the code and they do work, battery now constantly at 10%. I must say that I echo the comment "I thought most of these cars, well at least S4 had an AGM battery" to survive smart charging - even an ELB is better than a WET battery for this sort of installation. Or has battery technology improved so much that AGM and ELB are no longer required? Is it possible that the previous battery was potentially replaced incorrectly? Although that is still not an AGM battery. My 2008 B8 3.0 TDI uses a Varta I1. I would be surprised if the car has an AGM battery if it doesn't have stop start. You can tell what the battery type originally fitted was from the PR codes on the build sticker, There are similar threads on the forum. Brother in law (works at a cars spares place) has secured me a 110Ah 900A (IIRC) battery, perfect fit, Bosch, 5yr warranty for £90. New battery, car running slowly climbs up to 14.1, peaked at 14.3 with some revs. So it's getting a charge, good. 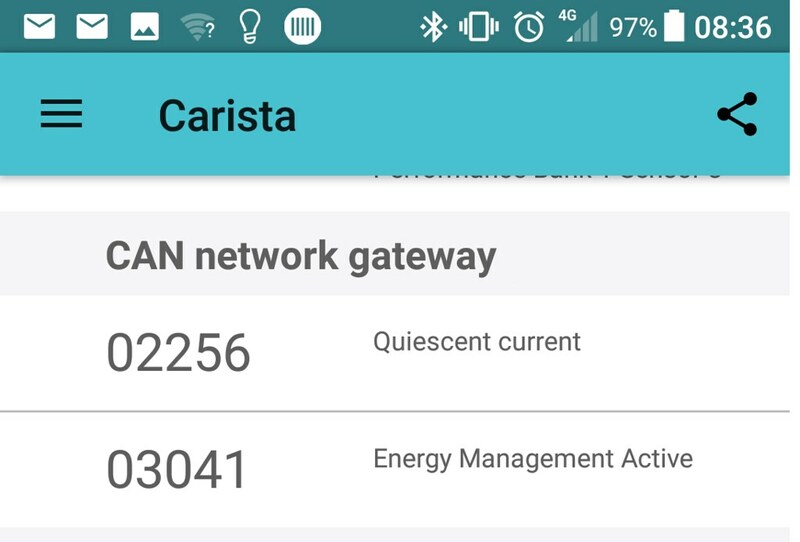 Got a 60 mile round trip tomorrow so will see what the MMI says as currently (no pun intended) it says only 10% of battery left and it is still triggering that error message on Carista. I'm hoping the drive improves it, if not I guess this might be the coding to the car people have spoken about? If neither cure it (God I hope they do!!) then I have no idea as getting the same problem on a new battery, so potentially the old battery wasn't duff! B8 S4s left the factory with AGM and no Stop/Start just "regenerative braking", ie smart charging. Edit:- that fact does seem to be getting ignored by many aftermarket battery suppliers. New battery seems to have done the trick. Did 30 miles to a meeting this morning with a decent run on the M25 and battery level up to 100%, never seen that before in the 18 months i've had the car, plus the 03041 Engine Management Active warning has gone and not gone back after the car was parked up for 5 hours, normally back in 5 mins. Will check it again in the morning to see if it's gone for good, if so it doesn't need coding and glad I didn't take up my local garages offer of £80+VAT to code. So did you fit the new battery? Cleared the codes and now everything is ok, without having to programme the car to say you have a new battery? If so that is exactly what I experienced last week, car just needed a good drive. The new battery was fitted 3 weeks ago but I still had the same problems. All I've done is disconnect all wires put on the car by myself and wait till last week when everything came back to normal. Without driving it on a long distance ar anything else. Still sounds like it could be the same as mine where the car has learned it has a new battery, especially as you said in your first post that you previously removed the wires but still the same. I suppose to prove it again you could reattach the light strip and see if the errors come up again? To code the battery it might be an "adaptation" rather than a long code. But I'm still learning so could be wrong.